The podiatry Multidisciplinary Homeless Initiative, which provides student-led podiatry services to patients in New South Wales and Central Queensland, has garnered a 2018 Opal Award for Excellence in Engagement. A digital media work-integrated learning model, a simulation toolkit that enhances the work-readiness of graduate nurses, a multidisciplinary health initiative for the homeless, and a targeted language-and-podiatry-services program for asylum seekers are all initiatives that have garnered a prestigious CQUniversity Australia Opal Award. Deputy Vice-Chancellor for Engagement and Campuses, Professor Pierre Viljoen, said this year’s awards received 35 nominations involving 166 staff and students from across CQUniversity’s national footprint. “Our Opal Awards for Excellence in Engagement recognise our staff and students for their outstanding engagement initiatives with local communities and beyond,” Professor Viljoen said. Professor Viljoen said engagement was embedded in CQUniversity as one of its five official core values. “Engagement ultimately strengthens the fabric of our University,” he said. “Whether it’s through research, social innovation, education and training opportunities or providing an external service – such as committee/board membership, project involvement or sharing the University’s facilities – our staff are committed to finding ways to link in with local community to yield mutually beneficial outcomes. Opal Award winners were announced at a ceremony held simultaneously across all CQUniversity campuses throughout Australia on 15 November. All winners were presented with a certificate, with those in the first four categories listed below receiving an opal pin and a $2500 grant to further their engagement activities. Engaged Education and Training award >Unique team-based service education model for digital media work-integrated-learning celebrates a decade of volunteering – by Dr Ashley Holmes, Brendan Murphy, Gianni Wise, Peter Cox and Andrew Martin. CQUniversity Bachelor of Digital Media students taking part in the Collaborative Digital Media Project Part A and Part B have the opportunity to use work-integrated learning techniques to tackle a challenging real-life project for an authentic client. Team members are required to research their client’s needs and propose potential digital-media solutions. With project examples dating back to 2007, one standout volunteer initiative resulted in students collaborating virtually from Brisbane, Cairns, Melbourne and Rockhampton to develop a new logo and establish a website and social media presence for the Kiribati Australia Association which won accolades from the then President of the republic. In 2017 when unit enrolments peaked, a total of 15 volunteer projects were undertaken including documentary videos, mobile application proof-of-concepts, 2D and 3D animations, and social-history recordings for museum-augmented reality hotspots. Enrolments look to be at record levels in 2019 too and registrations of interest for 2019 community projects are being sought until mid-December 2018 (contact the Unit Coordinator Ashley Holmes). Engaged Research and Innovation award >Tag Team Patient Safety – by Professor Kerry Reid-Searl, Professor Trudy Dwyer, Tracy Flenady, Leeanne Heaton, Tracy Levett-Jones and Dr Judith Applegarth. A Tag Team Patient Safety simulation toolkit was developed to maximise patient safety by facilitating work-ready nursing graduates. The toolkit includes a guide, eight written scenarios with learning outcomes and teaching plans, instructional online videos, a website and more. This collaborative project – between CQUniversity, the University of Technology Sydney, Australian Catholic University and Sunshine Coast University – has already gained national and international interest, and has spurred the creation of the Patient Safety Competency Framework for undergraduate nursing students. Engaged Service award >Multidisciplinary Homeless Initiative: Advancing and Promoting Health and Healthcare Access for People who are Homeless – by Julie Nguyen, Dr Malia Ho, Helen Bourne, Bridie Luva, Laura Hutchinson, Merridy Lithgow, Dr Kerwin Talbot and Samantha Swain. This initiative was borne from discussions between CQUniversity and stakeholders including private podiatrists, health professionals and community healthcare services who identified a need to establish a podiatry service that overcomes the financial and physical healthcare barriers of people who are homeless. Delivered by CQUniversity’s health clinics in Sydney and Rockhampton, the program provides free-of-charge, student-led podiatry services to those who are homeless or at risk of homelessness in New South Wales and Central Queensland. Since its July inception, more than 80 podiatry appointments have been offered to patients across both sites, and the service has been extended to include physiotherapy. There are also future plans to provide other health services including oral health, chiropractic and speech pathology. Social Innovation (Staff) award > Sydney PALS (Podiatry and Language Support): Making a difference to communities in need – by Ruth O’Neill, Gabriela Toth, Stephen Rankin, Laura Hutchison, Dr Kerwin Talbot and Merridy Lithgow. This cross-discipline community outreach program involves CQUniversity Sydney’s School of Access Education (SAE) and the School of Health, Medical and Applied Sciences (HMAS). SAE staff members provide one-on-one language sessions at the Asylum Seekers Centre (ASC), Sydney. This targeted approach has yielded a tangible increase in participants’ literacy skills and confidence. In addition, ASC users are offered free podiatry and chiropractic consultations at CQUniversity’s Sydney Health Clinic. This program, therefore, assists asylum seekers who are ineligible for Medicare, and provides specialised care that is not always available through a GP. 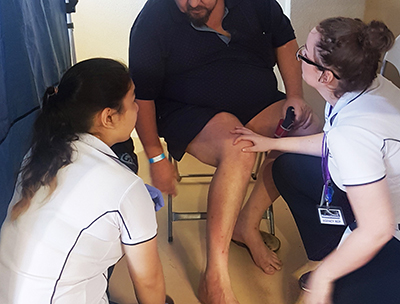 HMAS staff also provide free podiatry care at the Matthew Talbot Homeless Hostel and facilitate student podiatry consultations at the aged care Berger Centre. Social Innovation (Students) award >Two projects involving 21 students received recognition certificates – the CQUniversity Podiatry Homeless Initiative; and the Study of household dietary diversity in food-producing communities in rural Fiji. Engaged Internal Service and Engaged Service Learning awards > CQUniversity also recognised staff members Colleen Ryan and Tracey Simes for their internal service to the University via the Engaged Internal Service category and Master of Arts student Catherine Gamble within Engaged Service Learning. “Nothing makes me more proud than to see our staff and students supporting the development of our University and communities through strong relationships and productive partnerships, which deliver mutually beneficial outcomes,” Professor Viljoen said. “On behalf of CQUniversity, I congratulate all of our staff and students who have dedicated valuable time and expertise to engaging in such a meaningful way with the communities around them,” he said. View the full list of all staff and students recognised in the 2018 Opal Awards for Excellence in Engagement here.